Dizzy Working Mom: Rice Cereal: The Devil or Baby's Perfect First Food? Rice Cereal: The Devil or Baby's Perfect First Food? Is it just me, or should "babies" be possessive with an apostrophe? ﻿Ben started solids this past weekend! I think it is exciting for every parent to give their kids solids for the first time and watch their little face make funny expressions while they try to figure out what to do with the stuff. Total video-worthy moment (of course really him doing anything is a video-worthy moment to us). Of course, like everything else, when to start solids and what to give him is a controversial baby issue! At our two month pediatrician appointment, our doctor said he would definitely be ready to start solids at four months, because he was so strong. We didn't talk in depth about it at that appointment, but he said he could start on rice cereal or fruits/veggies puree, it didn't really matter. Our regular doctor was on vacation during our four month appointment when the time came to really discuss it, so I spoke about with the nurse practitioner. She said he should be started on rice cereal first, because it is easier to digest. Back when I was pregnant, I thought I would do baby-led weaning. But like lots of things, my mind has been changed by real life. In this case, by his doctor and by the situation of him being at daycare. With regards to doctor's recommendations about things, I just try to be generally informed and discuss it with him if I have read about other opinions. All in all though, I trust my pediatrician and really like him. He was really understanding about my concerns regarding vaccinations (a whole other issue! But don't worry, Benji boy gets his vaccinations, so don't yell at me! I will do a post about this at some point). So if he says Ben was ready to start solids at four months, then by golly, let's do it! So then my next decision was rice cereal or fruit/veggie puree for the first food? Dan and I discussed it and decided to go with rice cereal. I googled it a bit, and some people try to say that your baby is basically going to be obese if you give him rice cereal first. But, my doctor said it didn't really matter, and Dan felt more comfortable going with the old standby. Plus, I really don't buy into the thought that Ben is going to be influenced for the rest of his life by the fact that we gave him rice cereal. Now if I start giving him donuts everyday and force him to sit on the couch and not move starting at one year old, that's a different story. 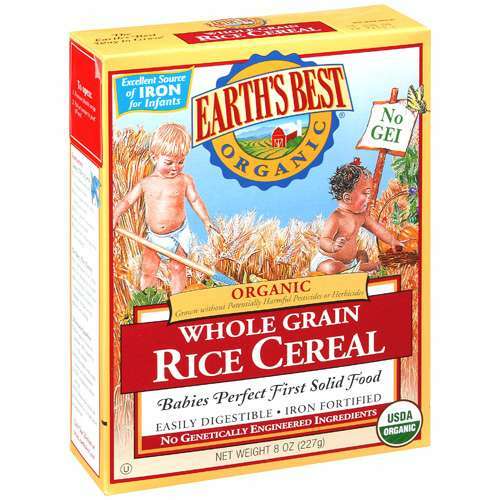 When I bought the Earth's Best Organic Rice Cereal, I felt really comforted that it said "Babies Perfect First Solid Food." Yes, I realize that of course they would say that because they want you to buy it. I don't care, I will get comfort from where I can get it. At the first feeding, it mostly went all over his face. He was very funny about it. I have fed it to him three times since then, and he seems to have gotten the hang of it! I make it by mixing it with breast milk. At first I would warm up the breast milk, but the last time I didn't and he didn't seem to care. The first time, I also made it really thin, but I made it much thicker since then because it is easier to feed that way. I think he likes it, because he seems to understand opening his mouth for the spoon now and is totally into it. Yay! I think we are going to start a fruit or veggie puree this weekend! *The video was taken during the first feeding. At the beginning you can hear Dan basically being grossed out that I tasted the food. But, I want to taste everything Ben tastes! If it is truly disgusting, why would I want to feed it to him? The cereal sort of tasted like sweet oatmeal, thinned down. It was sweet from my breast milk, not from any added sugar. And yes, I have tasted my breast milk.